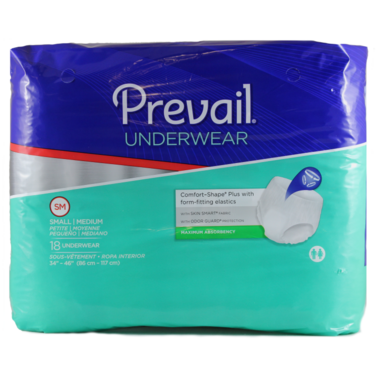 Prevail Underwear Maximum Absorbency is for moderate incontinence. Its pull on and off design allows the wearer to put on and take off like regular underwear. Plus the innovative discreet core adds to the comfort and discretion. Fits waists 34" to 46". This case includes 4 bags of 18 underwear (72 underwear total). My husband finds this product easy to use and good protection. This product works very well for me. It is easy to pull up and off and protects me well. Excellent product for the price. Is very comfortable and easy to don and slip off.